The crane was required to work at a radius that would allow the boom to raise straight up and over the building without hitting the skybridge to make the HVAC equipment lifts and load the old pieces onto trucks. Companies working on new construction projects often have several crane model options when it comes to a lifting project. Spaces tend to be less congested, allowing larger cranes to be easily maneuvered into location and quickly repositioned around the site to pick and place materials. A variety of options – swing-away and luffing jibs, full counterweights and boom inserts – can be added to the crane with relative ease to meet configuration requirements. It's during maintenance lifts on existing structures in congested downtown settings in major metropolitan areas when crane options narrow and the expertise and deep equipment fleet of a lifting company pays dividends. Add to the mix the challenge of not being able to lift over areas occupied by recovering patients, and you have the recent project successfully and efficiently completed by the Dravosburg, PA, branch of Anthony Crane USA by using its new Terex® AC 250-1 all terrain crane. Anthony Crane was brought in to support Pittsburgh's power and industrial contractor, McKamish Inc., to remove old HVAC units from the rooftop of the Allegheny General Hospital. "The building was 157-ft (47.9-m) tall, and we had to reach 40 ft (12.2-m) over the rooftop," mentions Ron Shearer, Account Manager/Crane Specialist at Anthony Crane. "There were a number of picks to be made, of which the heaviest weighed approximately 15,000 lb (6.8 tonnes)." Typically Anthony Crane would enlist a high capacity all terrain crane with a luffing jib and full counterweight due to the height of the building and the radius required to perform the lifts. However, this was neither a typical job nor typical circumstances. Work area confinements did not allow the assembly of the luffing jib for the crane, so only the main boom could be used. "The crane had to be set up in a loading zone to eliminate lifting over the occupied portions of the hospital," explains Andrew Longacre, GSP, of Anthony Crane. “The work area was extremely small and there was a sky bridge we had to work around that did not allow assembly of inserts or luffing jib." The crane was required to work at a radius that would allow the boom to raise straight up and over the building without hitting the skybridge to make the HVAC equipment lifts and load the old pieces onto trucks. "The only way to accomplish the lift was to use a crane that gave us a powerful main boom and capacity with just the main stack of counterweights, so it could fit in an area with minimal swing room,” adds Shearer. In his mind there was only one crane model that would fit the bill. 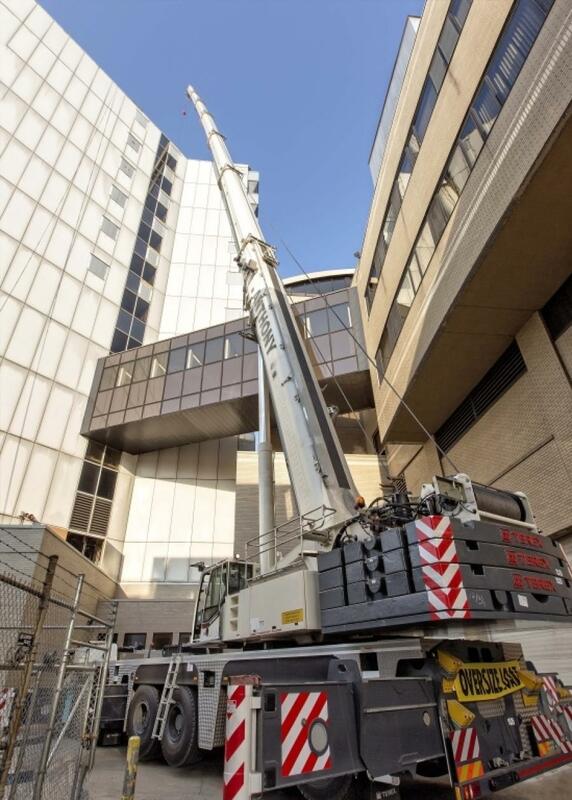 Recently added to Anthony Cane's fleet, the Terex AC 250-1 all terrain crane gave them the combination of power, main boom length and compact carrier size to efficiently handle the picks at Allegheny General Hospital. "The AC 250-1 crane is one of the most compact six-axle cranes on the market and offers the most compact outrigger base and tail radius work area in its class," says David Naab, Regional Business Manager for Terex Cranes. “Yet it has a 262-ft (80-m) main boom, which is exactly what Anthony Crane needed for this project." Because Shearer had the new 300-US-ton (250-tonne) capacity class crane at his disposal, this eliminated the additional time and expense of supporting equipment for a larger crane. Crew members did not need an assist crane to assemble and disassemble a luffing jib on site or the extra truck loads for jib transport. Additionally the extra manpower requirement for assembly/disassembly of the jib wasn't needed. "By using the AC 250-1 crane with only the main boom, we easily saved more than $12,000 compared to using a crane with a jib." The strength of this Terex crane's load chart also saved on the counterweight configuration for this project. The height of the building required the AC 250-1 crane's center pin to be 60 ft (18.3 m) off of the building. The operator used the full 262.5 ft (80 m) of main boom to reach the 40 ft (12.2 m) onto the building's roof to hoist the HVAC units and components away. This required an operating radius of more than 100 ft (30.5 m). Knowing the heaviest piece to be lifted weighed 15,000 lb (6,8 tonnes), Shearer prepared the amount of counterweight required for all the lifts. According to Naab, "The AC 250-1 crane offers a 16,200-lb (7.3-tonne) rated capacity when working at a 120-ft (36.6-m) radius with only 115,300 lb (52.3 tonnes) of counterweight." Shearer adds, "This allowed us to use only the main stack and not the winged weights to reduce the required swing room. Additionally, it saved us 4 loads and approximately $4000 in shipping costs to and from the site." Only the Terex AC 250-1 crane and 4 truckloads of counterweight and supporting equipment made the short 13-mi (20.2-km) trip from its Dravosburg yard to the hospital's downtown Pittsburgh location. Once on site, the operator took advantage of the crane's all-wheel steering to maneuver it into the cramped loading zone staging area. "The crane offers several steering options, including off-wall, all-wheel and crab to efficiently maneuver into tight spaces," offers Naab. In less than two hours the crane was rigged and ready for the lifts. In a matter of a few hours, the HVAC units and supporting components were picked from the roof and placed onto trucks for transport. "We had to carefully lift the units over the sky bridge to set the old units on the trucks," adds Longacre. While the weight and size of the pieces posed little challenge for Anthony Crane, the location of the lift certainly did. Having the combination of compact size, long boom and strong load chart of the Terex AC 250-1 crane helped the company to safely, efficiently and cost-effectively handle the job. "Where other models would've required inserts and/or a swing away jib, we were able to complete this job with only the main boom of the AC 250-1 crane,” mentions Mr. Ray G. Anthony, President & CEO. "This was the best option both operationally and economically for us and the customer. We also sincerely appreciated the full support of the Terex sales and maintenance teams, as they spent countless hours with our operator and technicians to review every part of the crane and were present for the first series of jobs." For more information on the crane please follow the link: Terex AC 250-1 all terrain crane.